A couple of years ago, my friend Mack shot an interview with me as I prepared for our annual Pi(e) Day celebration at my home in D.C. 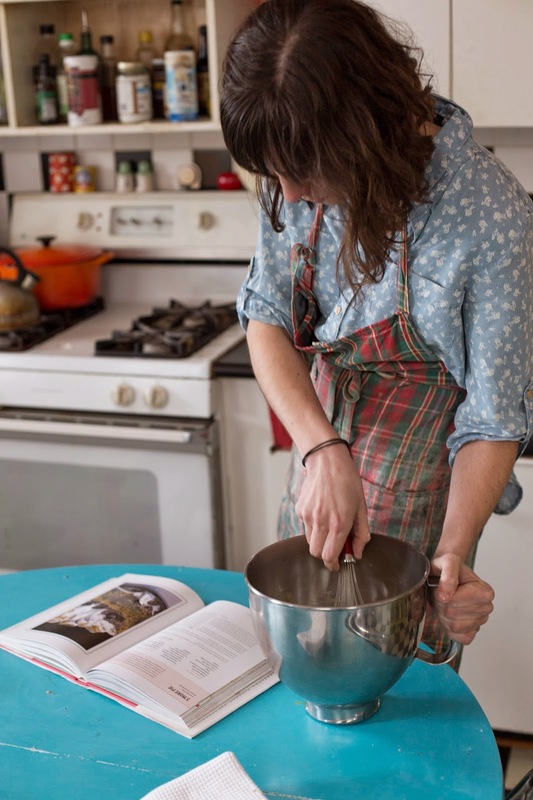 In the interview, I talk about how I learned to bake from my mom and grandmother, so ask Mack was putting together the footage, she asked if I had any photos of them working in the kitchen that she could use as B-roll. I asked my mom, and she scoured albums and photo boxes, and found none. There were pictures of desserts she had made, of my brother and I blowing out candles on homemade birthday cakes, and of the family sitting around the table at Thanksgiving, but there were no images of her doing the actual labor of home cooking. That struck me as odd and unbalanced. It may be my folkloric tendencies speaking here, but for me the images of daily work-- in messy kitchens, basement workshops, or leaf-strewn yards-- carry more emotional and narrative weight than the posed and stifled family photos taken during vacations or at graduations and family reunions. They capture us in situ, and convey a story about who we are and what we do and make and value. 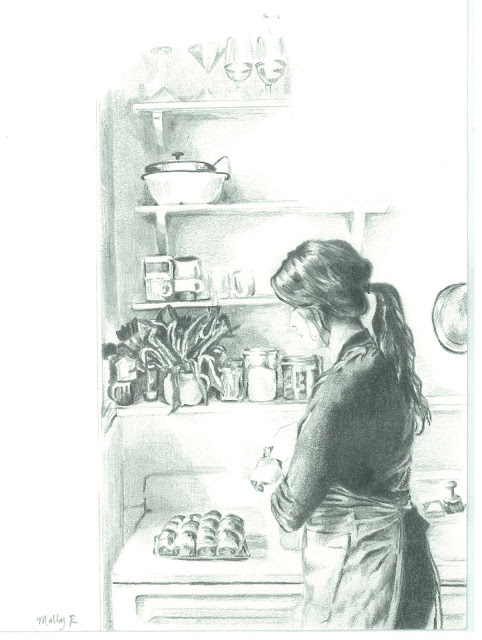 So I was particularly excited when artist Molly Reeder contacted me about her kitchen drawing project, in which she illustrating a series of images of cooks and bakers working in their home kitchens. She highlights this labor so beautifully, in grayscale pencil drawings that accentuate the gestures and stances of her subjects as they sprinkle sugar, wash dishes, or consult a cookbook recipe. 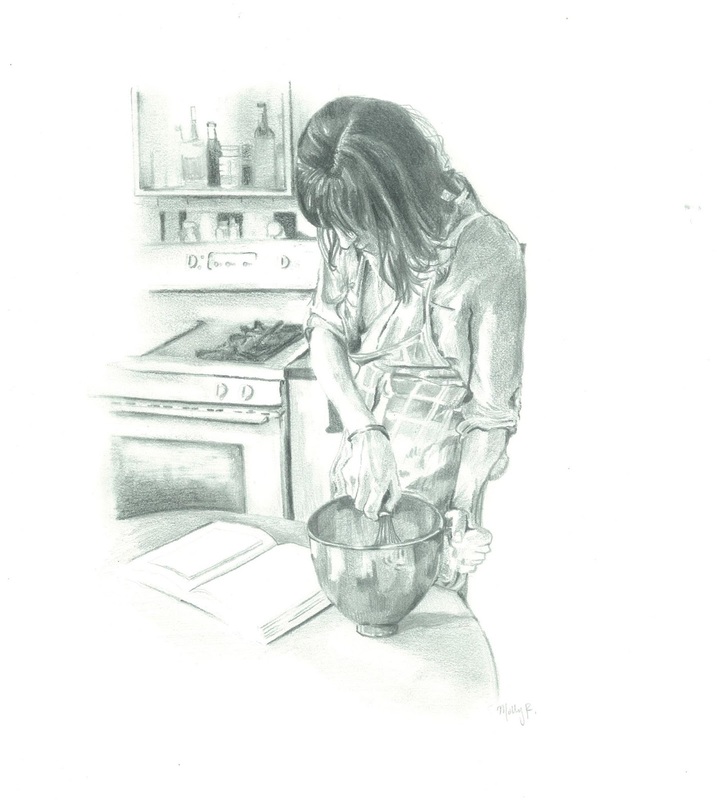 Molly illustrated a photo of me taken by Mack during those Pi(e) Day preparations of 2014, and is working on an entire series, including the one below of Yossy Arefi of Apt 2B Baking Co. I'm honored to be a part of this project which so elegantly illuminates the daily activity of kitchens, and I can't wait to see the final exhibit. You can find more of Molly's work and more about the series via her website and on Instagram. I got the chance to meet Molly this summer, and she is such a wonderful and kind person! I'm so excited that her work was featured on a blog I follow, and these drawings are absolutely beautiful! Amazing job Molly!!! Beautiful. Thank you for posting these lovely drawings.